The jamboree officially began on Monday, but Wednesday’s opening arena show made it feel like the party was just getting started. This morning’s show at the 2010 National Scout Jamboree boasted an impressive guest list, great entertainment, and a spirit of patriotism. It all took place on a 395-foot-wide stage outfitted with three huge screens, dozens of lights, and powerful sound. After a welcome by Anthony Thomas, the 2 millionth Eagle Scout, U.S. Secretary of Defense Robert Gates took the stage. 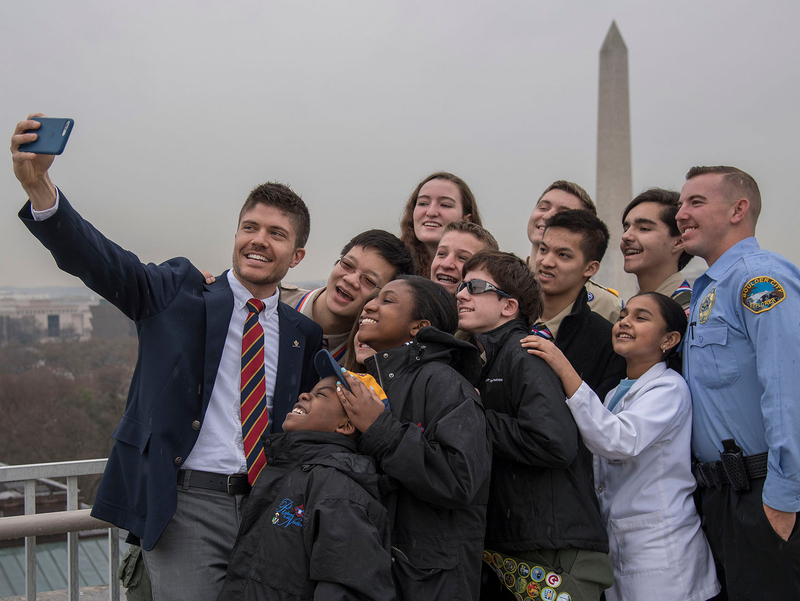 Gates, a Distinguished Eagle Scout and past president of the National Eagle Scout Association, told about serving as a troop leader and director of the CIA at the same time. That had its challenges, said Gates. Gates said he’s thankful for the Boy Scouts of America for guiding him through his career’s early stages. Gates was hardly the only noteworthy name in attendance at the arena show. Chief Scout Executive Bob Mazzuca addressed the crowd, telling a story about how traveling in his BSA uniform led him to meet so many interesting current and former Scouts and Scouters. Before Mazzuca’s speech, the show opened with a tandem of reality TV stars: Alex Boylan, winner of the second season of “The Amazing Race,” and Burton Roberts, who was a popular contestant on the Pearl Islands season of “Survivor.” Boylan and Roberts kept the Scouts entertained while the arena quickly filled with people. The Scouts and Scouters also offered a warm welcome to Bob McDonnell, the governor of Virginia, and Caressa Cameron, the current Miss America. Cameron offered some high praise to the BSA, speaking on behalf of her fellow Miss America contestants. Now that the jamboree has officially begun, more excitement awaits. Stay tuned. In the meantime, check out some photos from the show and the walk to it.